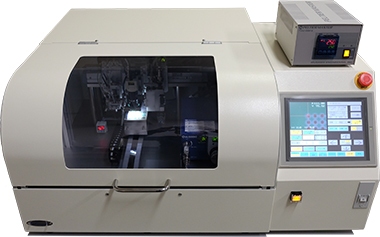 Table-top Single Solder Ball Placement System model STM-203FB is available for prototyping, R&D, and repair(re-balling) of BGA type IC packages and substrates. Operation with color wide touch screen for both machine operation and parameter setting enable to simply set various kind of BGA ball placement pattern, also display camera image. Solder ball placement can be made with unique solder ball separation unit which is simply interchangable. The system has built-in flux Dispenser with flux temperature controller which enable to apply consistent volume of flux accurately on each pads of BGA according to the placement pattern being set beforehand. Video 0.25mm solder ball placement, 0.25mm ball pad, 0.4mm pitch. Ball diameter 0.2mm – 1.0mm dia.